This high-performance anti-alias filter module can be used in either the CR9000X or CR9000 measurement and control system. The CR9052DC module measures accelerometers, strain gages, and microphones. The CR9052DC includes six anti-aliased analog measurement channels with differential input ranges from ±20 mV to ±5 V. Each of the six channels has its own programmable-gain instrumentation amplifier, presampling analog filter, and sigma-delta analog-to-digital converter. 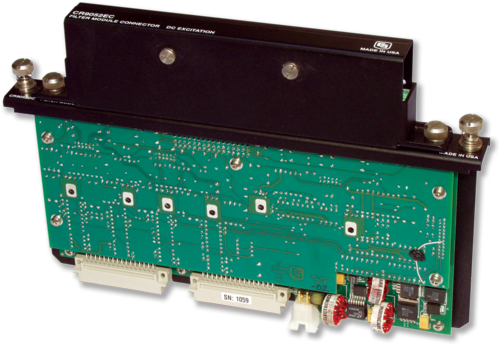 An on-board digital signal processor provides real-time, programmable anti-alias filtering and down-sampling (decimation) before passing the results to the datalogger’s main processor. The CR9052DC is a high-performance anti-alias filter module for the CR9000X-series and CR9000-series dataloggers. It is used to measure accelerometers, strain gages, and microphones. The CR9052DC includes six anti-aliased analog channels with differential input ranges from ±20 mV to ±5 V. Each of the six channels has its own programmable-gain instrumentation amplifier, pre-sampling analog filter, and sigma-delta analog-to-digital converter. An on-board digital signal processor provides real-time, programmable anti-alias filtering and down-sampling (decimation) before passing the results to the datalogger’s main processor. The CR9052DC includes one CR9052EC easy connector module. Easy connector modules allow sensor wiring to remain connected while the input module’s measurement electronics and the rest of the datalogger system are used elsewhere. Additional CR9052ECs are purchased as a separate line item. -NOTE- Note: Additional specifications are listed in the CR9052IEPE and CR9052DC brochure.